In-App purchasing is already available on the iOS, but it is not yet available on the hugely popular Android operating system. Earlier this year, Google has promised that, the In-app will be launched before the end of Q1 of 2011. And finally, Google has recently announced that, they have started testing the in-app billing on the Android Market and the service would be launched as soon as the next week. This is a good news for the app developers, since the in-app billing will help them to earn a great revenue from their respective apps. Google has opened up the Android Market for upload and end-to-end testing of the apps. Currently, the app developers can upload their apps to the Developer Console, create a catalog of in-app products, and set prices for them. Developers should note that, during the test transactions, the In-app Billing service interacts with the app exactly as it will for actual users and live transactions. App Developers should first read the security guidelines and should test their apps before uploading to the Android Market. 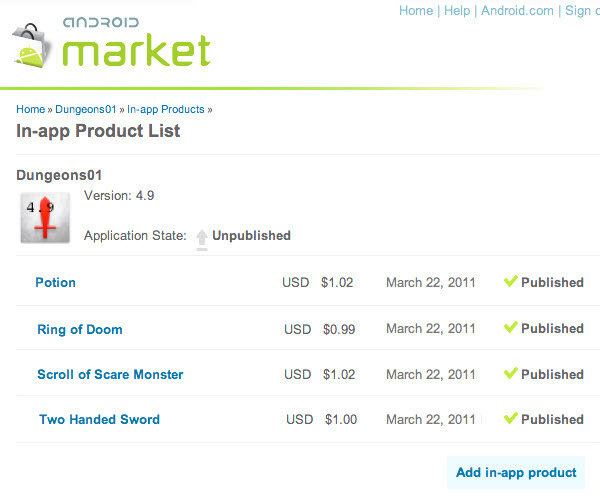 Google has not yet mentioned the exact launch date of the In-app billing on the Android Market. Until then, stay tuned for more info.